Department of Languages and Mass Communication, School of Arts and the Embassy of the United Kingdom in Nepal jointly organized an interactive talk program to mark 20th World Press Freedom Day on 3 May. In his talk on the status of press freedom, Ambassador of the United Kingdom to Nepal, His Excellency Andrew James Sparkes spotlighted on the importance of press freedom. His Excellency said, Nepali media has been operating vibrantly despite observable curbing on press freedom. The sense of press freedom, he added, should not be used by its practitioners for creating anarchy. Addressing questions of participants, he stated that the recent decision of Supreme Court regarding the entry of media persons does not sound commendable from the perspective of press freedom. 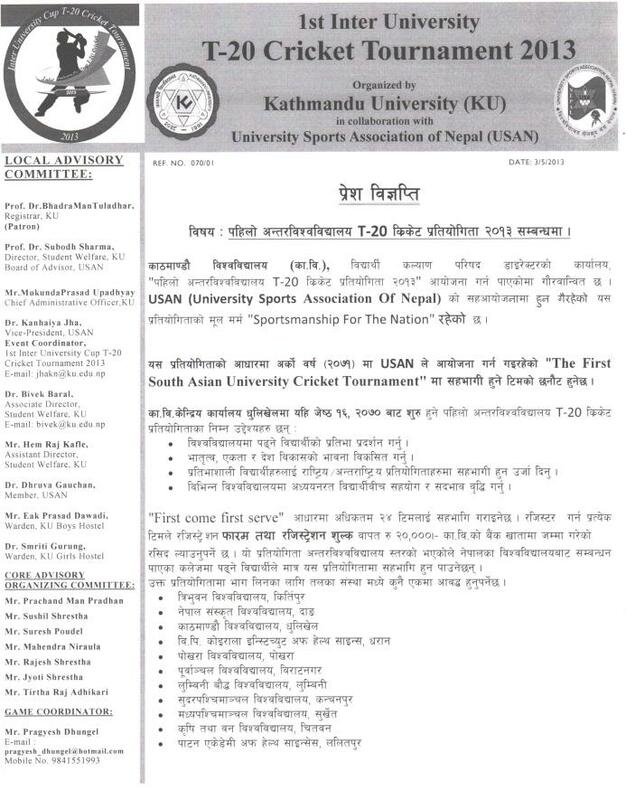 Registrar of the University Prof. Dr. Bhadra Man Tuladhar, Dean of School of Arts Prof. Dr. Mahesh Banskota, Dean of School of Science Prof. Dr. Panna Thapa, Director of Affiliation Affairs Prof. Dr. Sanjay Nath Khanal, head of different departments, faculties and students in Languages and Mass Communication Department, invitees from other institutions, and media persons from radio, print and visual media attended the program. Vice Chancellor of Kathmandu University Prof. Dr. Ram Kantha Makaju Shrestha offered token of Love to His Excellency. Prof. Dr. Jangab Chauhan welcomed the invitees and Prof. Dr. Mahesh Banskota concluded the program with short remarks. The program was run by Khagendra Acharya. 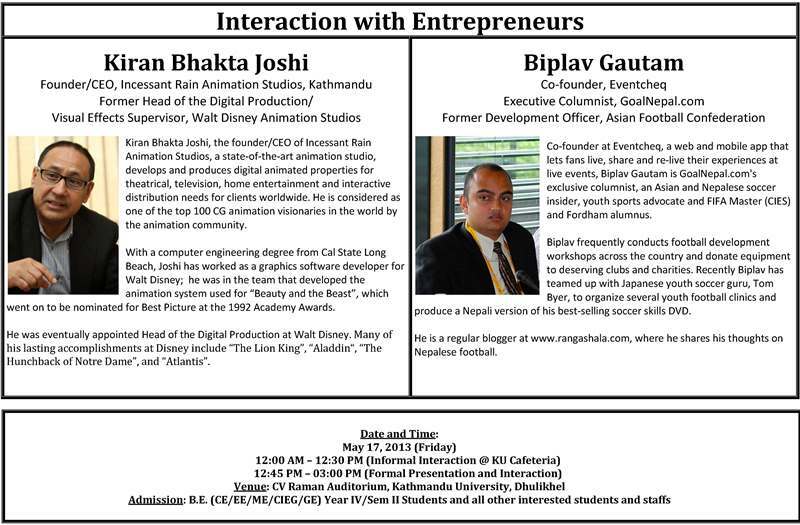 Fourth Media Conference, organized jointly by the Department of Languages and Mass Communication, Kathmandu University and Martin Chautari, concluded on 2 March 2013. Divided into three sections, it comprised inauguration along with key-note speech, paper presentations and panel discussion. Arjun Panthi, Khagendra Acharya, Rajendra Raj Timalsina, Ramesh Rai, Hem Raj Kafle, and Krishnaraj Sarwahari and Madhav Chaudhary presented their papers during the second session. Each presentation was followed by commentators' observations - Indra Dhowj Chhetry, Pam Gurung, Sunita Nemhafuki, Suresh Acharya, Keshav SIgdel and Sri Ram Poudel - and questions from the participants. During the inauguration session, Dean of School of Arts, Prof. Dr. Mahesh Banskota spotlighted on the importance of such academic activities. Prof. Dr. Jangab Chauhan, Head of the Department of Languages and Mass Communication briefed on the activities of the department and thanked organizing members for their efforts. Dr. Dharma Adhikari delivered key note speech on "Research, Esearch and the Journalistic Craft in out Times". Harsha Maharjan, an organizing committee member from Martin Chautari, shed light on the activities of Martin Chautari and spoke on why media conference is being organized jointly every year. The first session was conducted by Eak Pd. Duwadi. In the last session, a panel discussion was held on the use of social media. Gunaraj Luitel, Binita Barla and Hempal Shrestha presented their views on the issue and addressed questions raised by the participants. This session was run by Hem Raj Kafle. Peer Review Team (PRT) for Quality Assurance and Accreditation (QAA) of KU School of Science and KU School of Engineering visited KU main campus from 22-26 April 2013. The PRT comprised of Professor Dr. Sudarshan Tiwari, Former Dean, Institute of Engineering (IOM), TU, Professor Dr. H.P. Khincha, Former Vice Chancellor, VT, Belgaun, Karnataka, Professor K.B. Mathema, Director, QAA Division UGC-Nepal, Professor Dr. Hirdaya Ratna Bajracharya, Technical Advisor to UGC-Nepal, Mrs. Chirikshova Tamrakar, Dean, Institute of Science and Technology, TU and Mr. Shaligram Singh, Chairperson, Nepal Engineering Council. During the 5 day visit PRT had series of extensive interactions with various stakeholders of KU ranging from Executive Council members, Students, Faculty members, various admin and management divisions, alumni and parents representatives. They also visited campus facilities of two schools. PRT handed over their assessment report to Deans (Professor Dr. Bhola Thapa, KUSOE Dean and Professor Dr. Panna Thapa, KUSOE Dean) at the exit meeting held on 26 April 2013. The exit meeting was attended by Vice Chancellor Professor Dr. Ram Kantha Makaju Shrestha, Registrar Professor Dr. Bhadraman Tuladhar, Deans of KUSOS and KUSOE, Controller of Examinations Professor Dr. Pushpa Raj Adhikary, Heads and Coordinators of both Schools, Chief of Management Services Division and managers of various sections. Shyam Sundar Khadka, Assistant Professor, Department of Civil & Geomatics Engineering, Presented a paper on “In-Situ Performance of Micro Hydropower Plants in Nepal” at the International Workshop on The Role of Micro-hydel for Developing countries, 19-22 April Kathmandu Nepal. The Program was Jointly Organized by Centre for Science & Technology of the Non- Aligned and other Developing countries (NAM S & T Centre) New Delhi, India, Nepal Academy of Science and Technology (NAST), Nepal and Alternative Energy Promotion Centre (AEPC), Nepal. EnergizeNepal is proposed consolidated Program, for Norway-Nepal Cooperation in the Development of Nepalese Energy Sector. The first part of this program is to conduct study for exploring the possibility of establishing Norway-Nepal cooperation in non-governmental sector of Nepal for the development of Nepalese energy sector. The detailed study will be conducted to establish a consolidated program addressing Infrastructure, Competence building, and Industrial development/ innovation needed for development of energy sector in general and hydropower sector in particular in Nepal. The Programme is managed by Kathmandu University (KU), Nepal with close cooperation with and SINTEF Energy Research (SEfAS), Norway, and Hydro Lab, Nepal. It is funded by the Norwegian Embassy, Kathmandu. This study will be completed by end of November 2013. Application for the position of “Project Manager” in EnergizeNepal is hereby invited with the following minimum qualification. Master’s degree in one of the disciplines related to Management (with focus on project management), Technology and Innovation Management, Engineering (Related to Energy Planning) or a subject that is relevant to project execution and monitoring of study projects in energy or hydropower sector. The summary about the position are as follows. Contract Period: From April – Nov 2013. Excellent report writing, facilitating and communication skills. 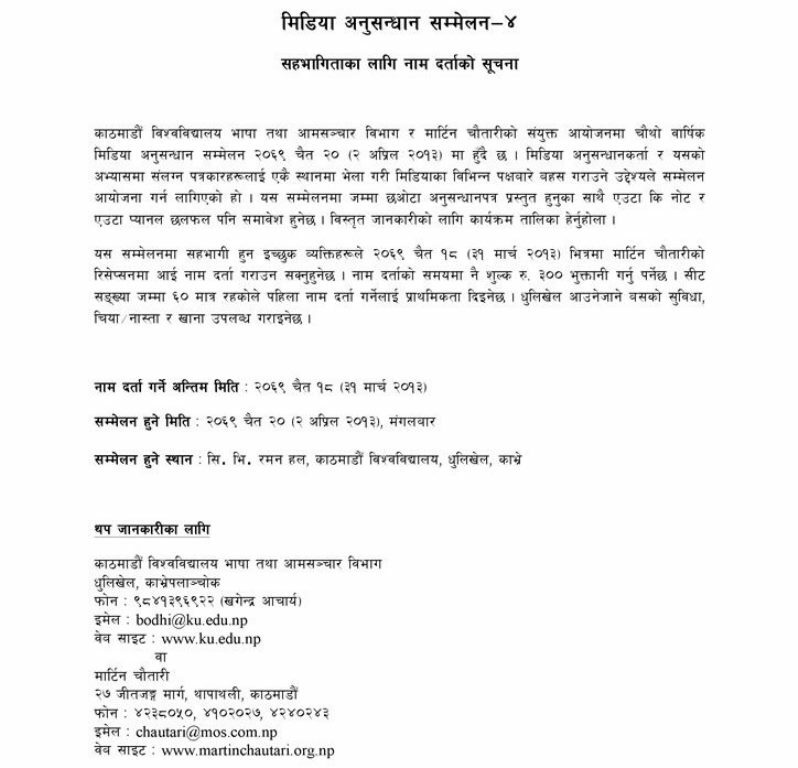 Excellent in both oral and written English and Nepali. Willingness to travel inside Nepal for project implementation and other purposes. Working experience in international development project or experience in coordinating and networking with NGOs, institutions, government and private sector will be preferred. Work to satisfy overall program goals and objectives. Assist the Program Administrator in planning, executing and monitoring of study groups. Maintain project schedule, track project progress, visit and implementation partner organization, and advice Program Administrator with regard to actions for improvement of performance of each study group. Organize workshops, seminars, and meetings. Maintain highest level of professional ethics, confidentiality, and transparency. Disseminate the Program outcomes and work for enhanced visibility. 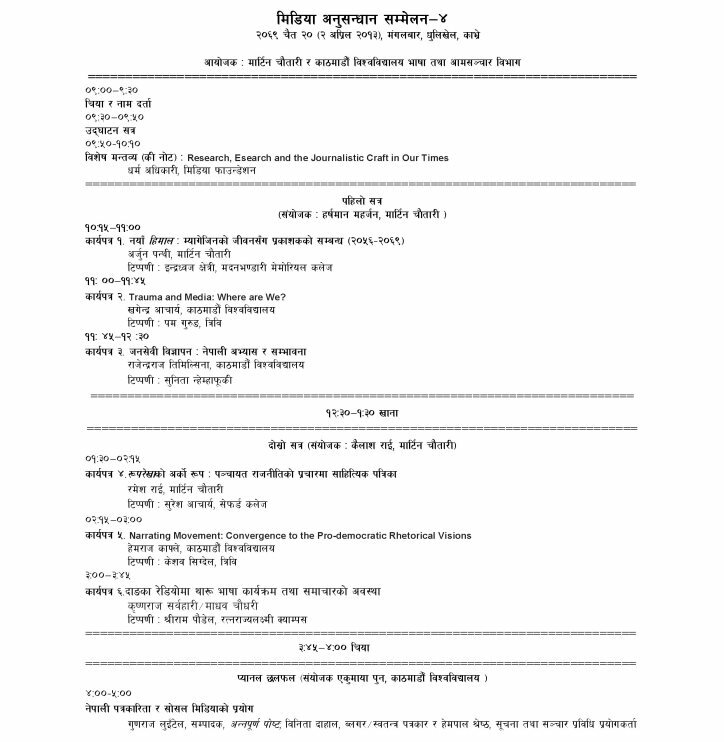 Compile final project document with the reports from each study groups. Application with a cover letter stating the motivation and the commitment promise, declaration of present and future professional commitments, complete curriculum vitae, copy of the certificate of the master degree, copy of transcripts of the degree, and copy of the certificates of experiences/other-competencies should be submitted no later than 21 April 2013. The application can be submitted to the office. NOTE: Please do not send the application by Post. Short listed candidates will be called for interview. Prof. Dr. Bhadra Man Tuladhar, the Registrar of Kathmandu University (KU) and the President of Nepal Mathematical Society (NMS), has welcomed Prof. Dr. Alla Dita Raza Choudary, the Director General of the Abdus Salam School of Mathematical Sciences (ASSMS), GC University, Lahore, PAKISTAN on Wednesday, April 03, 2013. The ASSMS is a unique leading research center of mathematics that has been established in 2003 by the name of famous Pakistani Nobel Laureate of Physics Prof. Dr. Abdus Salam (the founder of ICTP,Trieste). The ASSMS takes pride in being the quality educational institute of higher education in Pakistan. Prof. Dr. Choudary is also the Director of National Center of Mathematics (NCM), Professor Emeritus at Central Washington University, USA, and also the Convener of the 6th World Conference on 20st Century Mathematics 2013. During his visit, Prof. Dr. Choudary gave a talk on “A Different School of Mathematics” describing the initial stage, regular national & international mathematical programs and achievements of ASSMS, and also interacted with the participants. The dedication of Prof. Dr. Choudary regarding to the developments of mathematics from school level to higher education through this ASSMS is highly remarkable and appreciable. The participants in this program were Prof. Dr. P.R. Adhikary (Senior Mathematician and KU Exam Controller), Prof. Dr. Panna Thapa (Dean, KU School of Science), Dr. Deepak Subedi (HOD, Department of Natural Science), Dr. Dil Bahadur Gurung (Graduate Program Coordinator), Dr. Ram Prasad Ghimire, Mr. Manoj Shakya (Graduate Program Coordinator of CE), Mr. Rabindra Kayastha including faculties and research scholars of mathematics. Dr. Kanhaiya Jha was the coordinator of this interaction program. During this program, Prof. Dr. Tuladhar informed about academic programs and some major mathematical activities in Nepal and Dr. Subedi informed about the academic programs and activities of the Department of Natural Sciences. This program has helped our mathematics faculties and research acholars to participate in the activities of ASSMS. To know more about the ASSMS, please do visit its website: www.sms.edu.pk. Prof. Dr. Ram Kantha Makaju Shrestha, Vice Chancellor of Kathmandu University (KU) has welcomed the Director General of the International Center for Integrated Mountain Development, Dr. David Molden and his team from ICIMOD on 17 March 2013.The main purpose of the visit was to acquire the status of the ongoing project “Monitoring and assessment of changes in Glaciers, Snow and Glacio-hydrology in the Hindu Kush - Himalayas with a special focus on strengthening the capacity of Nepalese organizations (The HKH Cryosphere Monitoring Project)” and to interact with the project staffs, students and other faculties. The HKH Cryosphere Monitoring Project is being implemented by KU from August 2011. The project is funded by the Norwegian Ministry of Foreign Affairs through ICIMOD. The M.S. by Research in Glaciology course which was started since September 2011 is now in its second year. Extensive research on monitoring of glacier mass balance of Yala and Lirung Glaciers in Langtang Valley, Rasuwa district and Rikha Samba Glacier in Hidden Valley, Mustang district is being carried out continuously ever since the project started. 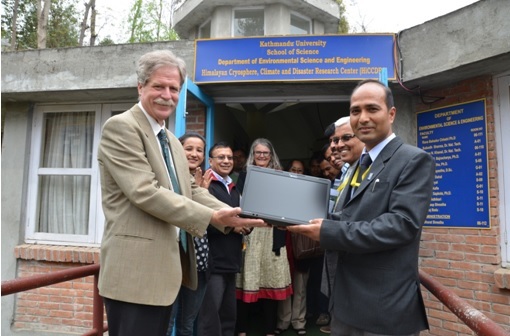 Dr. Molden has also handed over some laptops, desktops and scientific field equipments through this project to KU during the visit. It is hereby notify that the following applicants have been selected for the Master in Communication (2013-15) admission in School of Engineering at Kathmandu University. Selected candidates are requested to verify their documents in the Department of Electrical and Electronics Engineer and are requested to get admission before 2 April 2013. 1. Fill up the admission and registration forms, Attach Photos (PP) in all forms. (The forms can be obtained from Department of Electrical and Electronics Engineering office). 2. 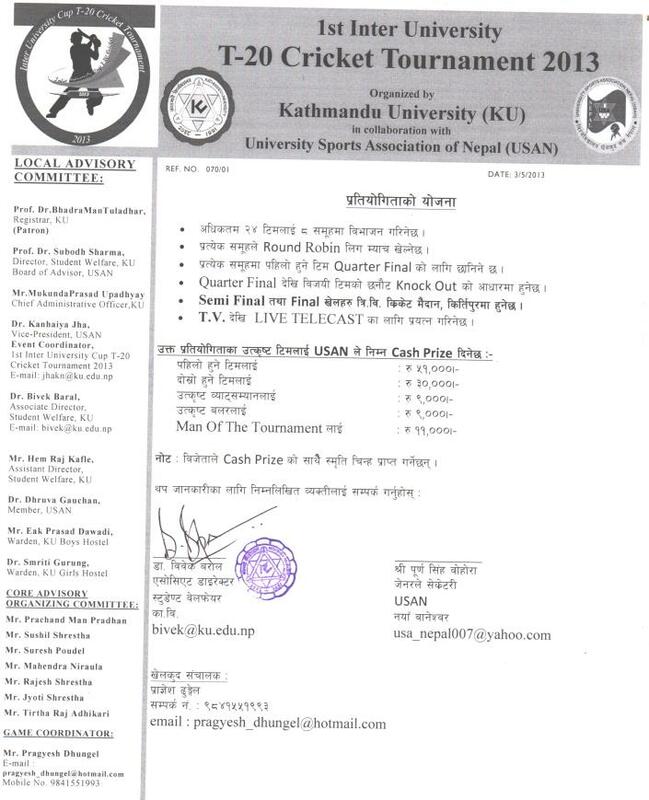 Pay the required fee to Kathmandu University’s Account at any branch of the following bank. 3. Attach the bank voucher to the completed admission form and submit the forms to the Department of Electrical and Electronics Engineering office. · Applicants who fail to complete the process by 3:00 pm, 2 April 2013 will not be considered for admission to the program and the seat will be given to waiting candidates.